Land casino is a gaming institution that constantly deals with huge amount of money. This attracts many dishonest players, obsessed with the idea to get money easily by cheating in casino or, what is worse, commit casino crimes. That is why land casinos security is crucial for safe casino operating and players gaming experience. If you enter the casino you can definitely feel that everything there is filled with security measures. 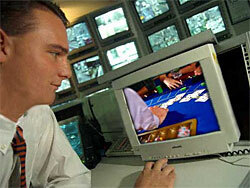 Some employees are in charge of keeping the eyes on gamblers during the games. There are also so called patrons that are responsible for safe and smooth casino operating. However, the dealers feel the biggest pressure as they have to pay attention to both games and players, as they are always in the center of casino gaming life. Dealers are trained to stay focused on the process of the game, as well as check the players' behavior, for example, whether they are not cheating in the card games or place wrong chips, or what is more, using cheating devices at the same time. Despite these trained staff, there are also pit bosses & managers that make sure everything is running perfect and watch over players and dealers as well. People are not all-powerful and can make mistakes or overlook something that is why special technical devices were created to help them in maintaining safety in casinos. The most popular high tech security system is called eye in the sky. It consists of many small cameras placed on the casino ceiling and they make the surveillance system. With the help of which casino security staff can view what is happening in the casino. These records can be later viewed in case of some crimes or cheating. Eye in the sky is a very comfortable security system as even the slightest misbehavior or dishonest process can be seen due to its perfect placement all over the ceiling. Apart from casino security systems and professional staff that take care of keeping order, there are also some unwritten rules and casino etiquette. It must be understood that players should stick to them so as not to break the law and to be on safe side with the casino.